Wisdom of Life. 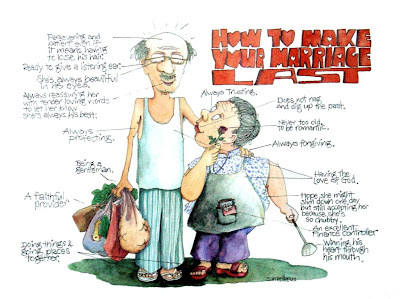 : How To Make Your Marriage Last!! Note: If you can't see the words above, click on the picture to blow it larger and you would laugh louder. Do you think this is true? ....."It is easier to be a lover than a husband for the simple reason that it is more difficult to be witty every day than to say pretty things from time to time." - Honore De Balzac. Humans may be greedy and horny, but luckily there is love out there that can satisfy the greed and the horniness. Cute picture... And reuseable shopping bags. Nice! Come over to our place, u meet your ideal man who would love u forever. Ok?